The number one sport in the Vendée is fishing; supported by the authorities both departmental and local communes. 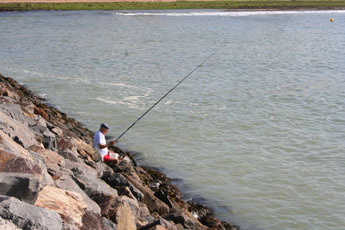 Virtually all forms and aspects of fishing are catered for in the Vendée. River Lake and Canal fishing. 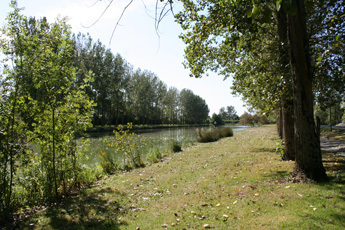 The Vendée has more kilometres of canals and rivers for fishing than any other Department in France, for all canal and river fishing a permit is required. For visitors to the Vendée a "Carte Peche-Vacance" is available which is valid from the 1st April until 30th September and cost about €30. This permit is available from tackle shops and tourist offices, and allows 15 consecutive days of fishing on all non private waters, including lakes and reservoirs formed from the rivers. Different lakes offer different opportunities for example the 127 hectare lake complex at Rochereau near Chantonay has a 2 kilometre stretch for carp fishing at night, whereas the small well stocked Plan d'eaus that most villages have, offer a haven of peace and tranquillity. 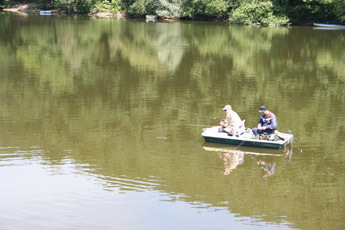 These local lakes often come under a permit that can be obtained from the local Mairie or Tabac and permits can often be purchased for a single day. There are often local fishing competitions which attract large numbers of competitors and of course have the obligatory refreshment stall. Other Lakes or Plan d'eau may be private and require no permit, just the consent of the owner. Catches are usually restricted, by law on public rivers, canals and lakes and by permit contracts on village lakes. For all of the fishing practices below, no permit is required, however there are restrictions on the minimum size and the quantities of the catch allowed. The fish you are liable to catch are simular to those you would find in the UK, Carp, Bream, Trench and roach as well as less common species such as catfish mullet and zander. Sea angling This is available from most harbours and there are organised sea angling trips available at most. The local tourist office will have brochures from the various boats,times of trips and cost. Beach casting This is a very popular form of the sport especially after a storm. It is also known as surf casting and the beaches of the Vendée are ideal for this pastime. Rock casting This is often practiced around breakwaters and jetties in the numerous harbours. Sea Harvesting This is the practice of collecting shellfish, either by raking cockles at low tide, or by picking mussels, oysters, winkles etc. from the rock pools. It is a great pastime for children but the locals in certain areas take it very seriously indeed. On the vast sand flats either side of the “Passage du Gois” a causeway that runs between the mainland and the Ile de Noirmoutier, there are often hundreds of people raking shellfish. At very low (spring) tides these figures are swollen to literally hundreds of cars and thousands of people, stretching as far as the eye can see gathering this free and plentiful harvest. There are restrictions inside harbours and you will need to enquire where the boundaries are if you want to collect shellfish near a harbour. Tidal river fishing This describes the practice of fishing below the sluice gates and tidal barrages. For all of the above practices no permit is required. Fishing tackle and bait are readily available, virtually every town has a sports shop that will have the tackle and many will have bait and the same goes for the larger super markets and hyper-markets.